You'll see . . . but won't believe! This amazing collection of 500 optical illusions brims with the best eye tricks and visual oddities. Try to figure out how many legs the happy hippo has; what's weird about a very unusual building; why a page with wiggly, wavy lines can make you seasick, and more! Some of the images go back hundreds of years, but they'll all astound you as they mess with your mind, your perception, and your brain. The Diagram Group, founded in 1960, has been producing high-quality graphic and text content for more than 50 years. Specializing in detailed diagrams, charts, tables, maps, and illustrations and the text to support them, the Diagram Group's titles have sold over nine million copies in 53 languages and 48 countries. 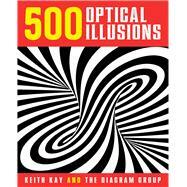 Keith Kay is the author of a variety of optical illusion and brainteaser books. His previous titles include: The Little Giant Book of Optical Illusions, The Little Giant Book of Optical Tricks, BrainStrains Great Color Optical Illusions, BrainStrains Eye-Popping Puzzles, and Colorful Puzzles for Wise Eyes (all Sterling).